Well thank you everyone for voting!!! I just wanted to go ahead and post this baby up here because I LOVE this dress!!! And Azriella's new kinderquinn!!!! Hi there, SYTYC fans! Today I present to you a dress that holds a lot of love behind it. I call it "the shabby spectrum" dress. Shabby because it's made from rows of scrap fabric, and spectrum not only to describe the multitude of color but also a token/homage/observance of this being National Autism Awareness month. It's very dear to me as my daughter was diagnosed in October 2010 with autism. And for those of you who don't know, they do a C.A.R.S. test on children to determine where their autism lies. It's called the spectrum and the ribbon for National Autism Awareness Month is a puzzle of colors. So a dress that looks sorta puzzle-pieced together in a cavalcade of rainbow bits which seemed mightily appropriate for my SYTYC audition entry! Plus it freed up some space in my enormous hoard of fabric scraps! This was such a fun dress to make! I surrendered my dear black eyelet from it's black fabric brethren where it's spent a year of it's life waiting to be released! So that in of itself got me giddy. Add to that the notion of surfacing some of my favorite "blast from the past" fabrics to let them shine once more, and you have a pretty pleased seamstress on your hands! Don't fret over all those little strips fraying either, because they are all cut on the bias so they'll just become delightfully shabby after it's washed. 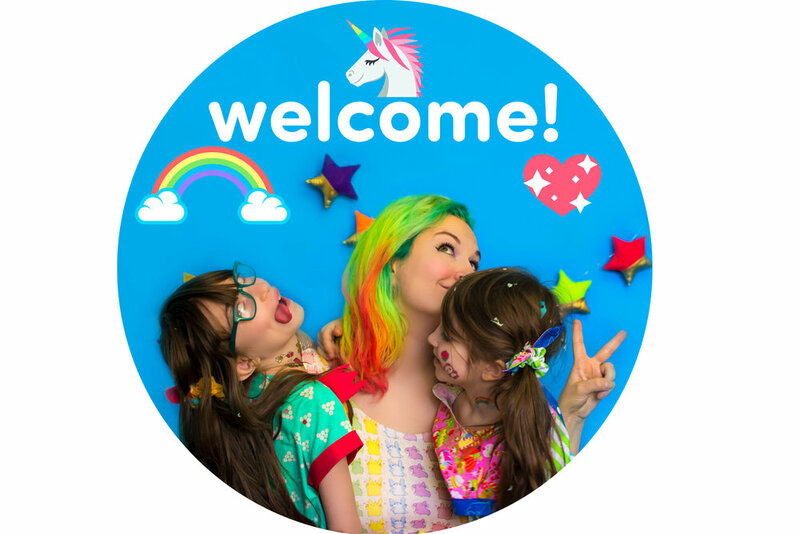 Peekabooing their way through the eyelet bodice is a rainbow striped lining, and the neck is finished with a retro rainbow stripping detail where the strips are allowed to dangle and be woven haphazardly through little playful fingers. It zips invisibly up the side and buttons at the top straps. The skirt is topstiched but then came the most fun part: crazy stitching! It's a technique I have seen before and have been itching to try! The "crazy stitching" consists of a double threaded needle of two matching hues for each layer. I love that it makes it look more puzzle-y and a little less proper and a little more fun! I highly recommend all seamstresses to try doing this! After always being told to sew a straight line, it is completely liberating to just do whatever! The hem is simply more tiny little bias strips pieced together with two different rainbow-hued threads. The hair band was braided with more strips of bias (are you getting the hint here ;-) and the little ballet slippers mimic the dress's bodice and lining.with red glitter vinyl soles and laced up with more bias strips! In addition to the dress, I also made a kinderquinn of my daughter (as part of my SYTYC entry!). The way I see it, if you're going to make a duct tape dress form, you had better make it something you want to look at! So I made it out of aqua, purple, and alien-monstery duct tape rolls. I love it... as does she! It also allowed me to free up a few gallon bags of serger scraps to stuff her with! So there you have it! A sweet little dress for my one of a kind prismatic little princess! Newer Postthe rainbow dash dress!